If the reduce, reuse, recycle mantra has a built embodiment, it’s arguably the recently completed Rediscovery Centre in Ballymun, Dublin – a 1960s boiler house for a much maligned early district heating system that’s been transformed into a sustainability education centre, and that makes use of a remarkably large palette of green materials and sustainable technologies. When the Ballymun Boiler House opened in the 1960s, it was by far the largest mass heating system in the country. It not only provided district heating to nearly 2,800 families, it also pumped fresh water directly to the newly built residential towers, obviating the need for local booster pumps. Fifty years later however, with the flats demolished, the boiler house had fallen into disrepair and the site itself had become a dumping ground for construction waste. It was overgrown in places and contaminated by oil in others. In 2013, Dublin City Council, Ballymun Regeneration and the Rediscovery Centre began a project to reinvent the site and create something unique in Ireland. The rejuvenated building would become an exhibition centre for sustainability and a home for the Rediscovery Centre – a grouping dedicated to providing community employment and training through a collective of innovative reuse enterprises. The design would exemplify sustainable refurbishment and showcase a wide range of green technologies and building methods. Funding was secured from both the exchequer and the EU’s Life and Environment Fund, and a lengthy design phase, led by ABK Architects, began in 2014. Main contractor Purcell - who draw from a vast experience in delivering high profile sustainable buildings, including a passive house school for the Department of Education in Moynalty, Co. Meath profilde in issue one of Passive House Plus - were appointed, and work started on site in January 2016. Ballymun Rediscovery- Centre opened a year later. The centre has been designed to ensure a minimum carbon footprint both in construction and throughout its life, while the structure features a very broad range of sustainable elements. The layout sets out to make best use of existing features and to optimise solar gains, while accommodating an improbable range of technologies including an air-to-water heat pump, a stove fuelled by an onsite willow plantation, and a combined heat and power unit (CHP), as well as both solar thermal and photovoltaic panels – a variety that would look excessive were it not for the role of the building as a demonstration project. There’s rainwater harvesting and green roofs, composting toilets, a liquid waste reed bed water treatment system as well as a long list of sustainable and reclaimed building materials. Perhaps the most fascinating element of the build has been the way in which the design and build teams sought to minimise waste and create the new building out of the old. There are two headline elements here worth mentioning. The team found a way to retain both the original concrete slab and the main steel structure. Davys calculates that this action alone resulted in the avoidance of 55 tonnes of embodied carbon – and that’s based purely on production impacts, without considering either disposal or transport. This same ethos was maintained throughout the project. The original building included aluminium louvres which at one time helped to dissipate the excess heat generated by the Boiler House’s three 35 tonne boilers. He explains that the process of choosing construction materials was based on an ordered prioritisation. First priority was given to materials salvaged from the boiler house itself. Next in line came building materials available locally from other building or demolition sites. Third were sustainable, natural, renewable materials or those made from recycled waste. If none of these streams provided what was required, materials with excellent thermal performance, low embodied carbon and environmental impact were chosen. For example: The roof deck of the old boiler house included a bituminous membrane mounted on softboard. This was not a material that the design team would have chosen to include, but at the same time, getting rid of it would have created a negative environmental impact. The decision was then taken to try to reuse it as a vapour barrier in the new build up. Often, a third way had to be found in order to retain materials that weren’t quite up to the job they had originally been installed to do. Most of the decking used on the old boiler house was aluminium, and lacked sufficient resistance to retain the new fixings. Instead of ripping it up and throwing it out, OSB board was used together with expanding anchor rivets to strengthen it. One of the Rediscovery Centre’s reuse enterprises is Rediscover Paint. There, old, non-hazardous, water-based paints are collected from the public via recycling centres, then remixed and offered locally – and affordably – to residents and community organisations. This salvaged paint was used throughout the centre. Furniture and fittings that had been destined for landfill were also upcycled and reused. And of the three original 35 tonne boilers, one was retained as a ‘symbolic vestige’ of the original function of the building, while the other two were sent for recycling. The design team had originally envisaged that recycled railway sleepers would be used to demark the kitchen garden. When these proved costly, the team took a fresh look at the site and ended up cutting up and re-using some of the boiler house’s old steelwork. This approach permeated all aspects of the design, not just the selection of materials. The building itself is a large, single volume, into which an additional floor was added during the construction phase. The site also features an adjacent, disused concrete reservoir. This provided an exhibition route that allows tour groups coming through the building to cross the bridge to the garden area, then descend the constructed slope at the other side. Part of the brief was to create a ‘3D Textbook’ which would use the project as an educational tool, with the ultimate aim of inspiring behavioural change in everyone who passes through its doors. This motivation led to one of the central challenges of the build. If the designers had focused exclusively on creating a comfortable, healthy environment using sustainable materials, the palette of elements and technologies would have been kept tight and efficient. Instead, a range of complications were designed in. In order to tie the disparate elements together, certain common materials were deployed. First among these was hempcrete. Composed of hemp and lime, hempcrete provides structural strength, first and foremost, but it also acts as a vapour permeable insulator. It was used in the south and east facing walls of the centre. By using hempcrete, the team avoided high embodied energy alternatives such as concrete blocks and cement, or indeed petrochemical insulants. 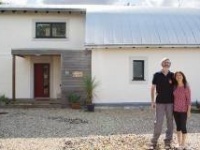 Davys points out that despite the fact that hempcrete has been used in structures across Europe for the past ten years, the Rediscovery Centre is the first public building in Ireland to use this material. Compared to virtually all of the buildings published in Passive House Plus, the U-values are relatively modest. In some ways the building is an inversion of the passive house approach – where the emphasis is on passive approaches to meeting heating needs, combined with mechanical ventilation to ensure good indoor air quality while recovering precious heat. In this building, it’s fair to say there’s more emphasis on sustainable mechanical technologies to heat and power the building, with passive approaches to delivering indoor air quality. It will be fascinating to see how an attempt at low energy building that’s so conceptually different from passive house performs over time. M&E engineer Brian Homan of Homan O’Brien acknowledges that the broad suite of heating technologies were installed primarily for demonstration purposes, adding that all have been fitted with sensors and recording devices to keep a close watch on how they perform. As yet, the data collected hasn’t been subject to detailed analysis to establish whether the building performs to its ambitious targets: Homan O’Brien used dynamic modelling and simulation to prove that 80% of the building’s energy use would be generated on-site. (IES simulation software was also used to predict daylighting, natural ventilation and overheating levels). One of the big challenges from Brian Homan’s point of view centred on achieving the right balance of efficiency and thermal comfort from the variety of systems as the seasons pass. The Rediscovery Centre’s water management and drainage systems were designed to minimise waste water discharge, mains water use and sewage sludge generation. Conversely, the system maximises water recycling and nutrient recovery. In addition to rainwater harvesting from the building roof, the building features waterless urinals and composting toilets which make use of the onsite reed bed system. Urinal waste water is collected and used for plant nutrition in the internal comfrey wall. There is permeable paving and a vertical living wall, as well as green roofs. As with all of the systems in the centre, monitors are installed throughout, in order to keep track of usage and to ensure water quality. The building is ventilated passively, via windows at high level which can be triggered to open automatically. This system is supplemented by some mechanical ventilation in toilets and workshop areas – particularly the paint recycling centre which would have a requirement for additional air changes. 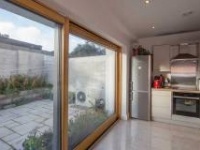 The heating technologies are co-ordinated by a BMS installed by Control Tech Ltd. Nigel Hayes of the company says that the system is calibrated to select the most efficient technology, or combination of technologies to run the building at any given time. It is aided in this task by an onsite weather station which measures temperature, relative humidity, barometric pressure, rain intensity, wind speed and wind direction. In addition, indoor sensors measure everything from temperature to CO2 and total volatile organic compounds (TVOC) levels. All of these systems can be overridden for educational purposes, so that it is possible to select whichever technology is to be demonstrated. The system can also be used to co-ordinate the building’s electricity use, balancing the CHP and the PV system to prompt the most efficient use of power. Control Tech also supplied a traffic light ventilation system – which may prove a critical way of protecting occupants from the risks of indoor air quality declining, given the potential for large variation in air change rates in naturally ventilated buildings. As long as air quality in the centre remains good, a green light is displayed. Once CO2 or TVOCs move above pre-programmed set points however, that green light switches to amber, while red is displayed if another set of thresholds is breached. Users then react to these signals by adjusting ventilation levels to improve air quality. A similar system operates for gas, electricity and water use. If these move above baseline set points, the traffic lights prompt a change in user behaviour. Building services, construction materials and pipework have been left exposed and are labelled so that visitors know exactly what they’re looking at. There are viewing panels into plant room, workshops and out onto the roof. The project shows exactly what can be achieved from a site that three years ago was a rundown eyesore. It’s fitting too that the site of the country’s first ever district heating system has been repurposed to create an exemplar of sustainable construction. 1 A panel of internal plasterboard intentionally removed to reveal the internal Hempcrete, a combination of hemp and lime that provides both insulation and structural function; 2 The derelict boiler house prior to the refurbishment; 3 Timber shuttering system for construction of the Hempcrete walls; 4 The timber frame wall sections were insulated with 150mm of reclaimed sheeps wool. There’s clearly an awful lot to say about individual sustainability features of the Rediscovery Centre, and it’s little surprise the judging panel at the 2017 Green Awards – who must have felt overwhelmed at the sheer level of detail – gave the centre not just the Green Building and Green NGO gongs, but also the overall Green Award. But what is the net effect of such a rigorous attention to reducing material impacts? If truth be told, it’s hard to say. The building wasn’t assessed using an environmental rating tool such as BREEAM or LEED, and it’s arguable whether such an assessment would have truly cast light on the extent of the building’s innovations in material use, reuse and recycling – neither tool attempts to quantify and publish the various environmental impacts of the choices made, be it in terms of anything from CO2 emissions embodied in the manufacture of a given material, to the amounts of hazardous materials used. This kind of detailed life cycle assessment – which would involve quantifying material impacts in the same way that energy calculation tools such as PHPP, national methodologies and dynamic simulation tools do to varying degrees of accuracy for energy performance – is still in its infancy, especially in terms of an approach that can be applied at scale. 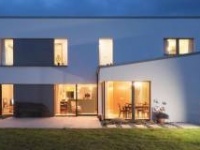 As Passive House Plus has previously reported, perhaps the best hope we have of really getting to grips with life cycle analysis is in combining the likes of environmental product declarations (EPDs) for materials – which can give us quantifiable data on individual materials – with new BIM tools (provided the information in those BIM tools accurately and in detail reflects the building’s eventual construction, of course). The ideal scenario would be if information from EPDs is automatically populated into BIM tools when a designer is inputting information on a proposed build spec, so that the effect of changing a material, an overall build-up, or even opting for a more compact building form could instantly be seen. And once enough buildings of a given type had been put through such a tool, benchmarks for average life cycle costs for each type would emerge – and with it the possibility of mandating quantifiable reductions under building regulations. In the absence of such data – in particular for Irish buildings of any kind, let alone buildings of a similar type to the Rediscovery Centre – it’s questionable whether a life cycle analysis would tell us much about this building’s greenness. Frankly we have nothing equivalent to compare it against, at least in an Irish context. That’s not to say such an exercise would be futile, even if the task is made harder in the absence of the sorts of software innovations described above. On the contrary, we need to begin this process of quantifying the environmental impacts of our buildings – whether exemplary or run of the mill – as soon as possible. The environmental crises facing society are so vast, and the buildings we build or upgrade today will, with luck, be standing at the end of the century and beyond. We urgently need to know whether and to what extent those buildings are likely to help to reduce the built environment’s impact on the natural environment, or whether they’ll act as stark, physical symbols of this generation’s failure to consider our effect on future generations – or even on the lives of people who have already been born. Building type: Redevelopment of derelict district heating boiler house into new social & community resource centre, incorporating original original steel structure & concrete slab. Ground floor: (At perimeters on east and west elevations only) 600mm concrete on DPM on 100mm of Kingspan Kooltherm to underside and face of concrete. Overall floor U-value: 0.32 W/m2K. Externally insulated walls: Existing concrete brick and open cavity wall overclad externally with 100mm Pavatex woodfibre insulation and Baumit mineral stucco finish. U-value: 0.3 W/m2K. Hempcrete walls: 300mm Hempcrete, followed outside by ventilated cavity and various external rainscreen claddings. U-value: 0.18 W/m2K. Timber frame walls: External timber rainscreen followed inside by timber-frame with 150mm reclaimed sheeps wool & 40mm Pavatex woodfibre insulation, plasterboard internally. U-value: 0.18 W/m2K. Roof: 140mm high performance insulation with TPO membrane on OSB board on existing reinforced aluminium decking. U-value: 0.16W/m2K. Windows: Carlson Optiwood, with laminated timber painted window frames, double glazed 4-16-4mm, typically toughened outer pane, laminated inner pane, coloured bottom metal bead to match paint finish. Average U value: 1.4 W/m2K. Heating system: A 20 kW Neura L20EuC air-to-water heat pump – with a COP of 4.3 at air 2C / water 35C – as primary heat source when there’s no demand for domestic hot water. Programmed to operate early in the morning to generate low temperature hot water for the heating system during “night rate” electricity hours. The hot water is then stored and can be used to heat the building during the day. A gas-fired SenerTecDachs Micro combined heat and power (CHP) system is the primary heat source when there is a demand for domestic hot water and produces high grade heat as well as generating electricity. Both systems are controlled from the building management system computer. The thermal output and the electric output of the CHP is monitored and the information stored so that it can be displayed and recorded for performance purposes. A south-facing 15 sqm Kingspan Thermomax HP400 solar thermal array contributes to hot water supply. Other heat sources include a 1 kW Ecoboiler HE multi-fuel stove with back boiler to burn onsite willow, with a stated net efficiency of 71.5%, and a 30 kW Quinta Pro 30 gas fired wall hung condensing backup-boiler, with a SBEM rated seasonal efficiency of 97.6%. The system has two heating circuits – one each for radiators on the ground and first floors. Ventilation: The building is predominantly naturally ventilated. Mechanical ventilation is typically only used in WCs and the compost system ventilation exhaust. WCs have natural ventilator windows as well as mechanical extract. Thermally broken manually operated Renson TH 90 window vents. Openable windows within the spaces. The system consists of a CO2 sensing system with manual control in order to enhance the natural ventilation strategy and to improve the air quality within the individual spaces. This system allows the occupants to understand the need for clean fresh air and control of their own environment. The woodworking workshop has a cyclone system that takes the dust out of the air and returns heat to the space. Electricity: 16.4 sqm south-facing 2.5kWp solar photovoltaic array (10 x 250 kWp panels) with Goodwe inverter. Lighting controls include extensive occupancy detection and daylight detection, with LED lighting throughout. Green materials: All materials selected with regard to reuse, recycling, sustainability and embodied energy. Material finishes selected for low levels of VOCs, petrochemicals and environmental toxins. Timber products are Irish where possible and FSC certified. Lime based internal plasters, recycled brick and upcycled louvres, reuse of concrete slab, steel structure, aluminium roof deck, masonry walls and concrete chimneys from original building, salvaged brick, sheeps wool reused from another DCC site, hempcrete walls, low VOC paints, Irish softwood, cardboard ducting for mechanical ventilation, no use of PVC, low VOC glues, formaldehyde-free MDF, staircase balustrade of Irish fir. 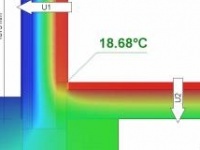 Acara Concepts supply natural thermal & acoustic insulation solutions which are vapour-open & high performing. We also supply movable acoustic walls. MEDITE SMARTPLY is a market leading manufacturer of sustainable timber construction panels.